Rev. Yolanda M. Norton spoke with Mika Elizabeth Ono of the Bulldog Blog about the upcoming Beyoncé Mass, a worship service to be held the University of Redlands’ Memorial Chapel on Monday, January 21, at 7 p.m. Rev. Norton, who created and will lead the service and the preceding day’s panel discussion, discussed her hopes and goals for the gathering, responses to her critics, and how the observance relates to Martin Luther King Jr. Day. Bulldog Blog: What do you hope to achieve with the Beyoncé Mass at the U of R? Rev. Yolanda M. Norton: At a basic level, I hope to encourage people to acknowledge the contributions of black women and to present a different vision of the Church and Christianity. Instead of talking about who belongs and who doesn’t, the overarching message of the Beyoncé Mass is we're all created in the image of God. There is space for all of us, and God is love. That’s important and in a world that's so bifurcated, with people at odds with one another. It matters because young people are not going to church as the Church is often not speaking to their reality. This service brings together multiple aspects of who people are and calls that space divine worship. When we all gather from our different social locations, God is in the midst of that. BB: Was that your experience at the last Beyoncé Mass, which you organized at San Francisco’s historic Grace Cathedral last April? Did it meet your goals? YMN: It did bring people together. With each service, we're hoping to do better and be more, but, at a bare minimum, we saw people there who had been in the Church their whole lives and people there who hadn't been in decades. All those people were coming together and talking about a God encounter. People who had felt ostracized from the Church because of their sexuality or gender identity or race came to the service and decided they needed to figure out a new vision of the Church and God. That all of those people were together one space speaks volumes about the project and what it is doing. BB: How did the worship service come about? YMN: The work for me really goes back to soon after I started in ministry about a decade ago. I was leading a retreat for young women. We had a great conversation, and this group of young black women was completely animated. Afterward, in the car with the chaperone and the girls, there was complete silence. The chaperone leaned over and said, “They don't know what to do with a minister in the car.” I said, “Well, can I play some music?” I turned on Beyoncé and Michael Jackson, and they were astonished, and suddenly we could relate. In my Ph.D. program, I constructed a course, Beyoncé and the Hebrew Bible Womanist Interpretation—it is a conversation about how black women encounter the biblical text. Part of the course required students to plan a worship service. The original Beyoncé Mass actually happened at the chapel at the San Francisco Theological Seminary with students. Grace Cathedral asked if we would do another version for their mid-week service. It took on a life of its own. One thousand people showed up in the middle of the week in the most secular metropolitan area in the U.S. That says something about the kind of experiences people are looking for and the power of acknowledging that whoever you are—black, white, Asian, Latino, male, female, nonbinary—you're created in the image of God. You're not a mistake. And there is love for you. Religious communities need to find ways to be relevant. Critics say we don't need anything but the Gospel. But we’re not creating new sacred speech; this is a part of the age-old conversation about the intersection of the sacred and secular. I find it fascinating that people did not have a visceral response to U2charist, which is a white Episcopalian service using the music of the band U2, or the black Church’s use and adaptation of secular music. But with Beyoncé—now we've got a problem. BB: Could you talk a little more about the criticism? YMN: There were some visceral negative responses to the Beyoncé Mass. I don't respond to anything on social media, positive or negative. But there was a period where I was watching the dialogue unfold on Facebook. Friends or colleagues would respond to critical posts saying, “No, I know her,” and putting the work in a larger context. It turns out most critics actually hadn’t read the article or watched the video. I don't mind if people don't like the service, but why can't one engage with it and learn what it is beyond the headline? Why can't we have a conversation? We are not deifying Beyoncé; we are simply trying to have a worship service that takes seriously black women and our contributions to society, and Beyoncé is not outside of that. YMN: Beyoncé is a little over a year older than me. So that music has been the soundtrack for my own evolution. Those songs have been with me through different emotional, spiritual, and psychic spaces. I thought, “If that is happening for me, it is probably happening for other people.” I'm sure that others could do a worship service with other artists, but that's the musical language that resonates with me. YMN: No. I often joke with folks that if I hear from her, I’m not going to turn her down. But the desire of the work is not for me to meet Beyoncé or to gain notoriety. It is to do what I feel is deeply needed work. BB: How about the second word—why “mass” in Beyoncé Mass? Isn’t a mass primarily Catholic? YMN: Part of the beauty of the Beyoncé Mass is that it transcends denominations. Grace Cathedral, where we held the last Beyoncé Mass, is Episcopalian, and they use the term “mass.” We worked that into the title, and it felt right because of the way it puts tension between the religious and the secular. I've been asked if we would do this in a theater or public space. I want it to be in a religious space so the Church has to contend with it and it’s clear that it is a worship service. While there are performative aspects to every worship service, this is not a performance or gimmick. There’s formation, vocation, and call wrapped up in this work for both my students and me. Most of the students who were in the first two services will be with us here in Redlands. They’re caravanning down from Northern California to be here for the mass. One of them has graduated but she, too, is coming down to participate. I wouldn't want to model anything bad for them. They all take their calling seriously enough to want to be part of something that's meaningful. BB: How would you connect the Beyoncé Mass with Martin Luther King Jr. Day? YMN: We’re trying to honor the work that King did as part of a movement of justice and to keep doing the work of justice. You can't celebrate King if you're not going to celebrate liberation, and you can’t talk about liberation if you are not going to talk about the liberation of all people. I think King himself would say he didn't do it by himself, and it didn't start or end with him. The civil rights movement involved so many people making so many sacrifices. Many times, black women participate in movements of liberation and are not seen. Martin Luther King, Malcolm X, Jesse Jackson—those names are part of the common vernacular, but when I start talking about Fannie Lou Hamer or Ida B. Wells, people get confused. That's part of why we're having the panel discussion on Sunday. BB: Tell us more about the panel discussion. 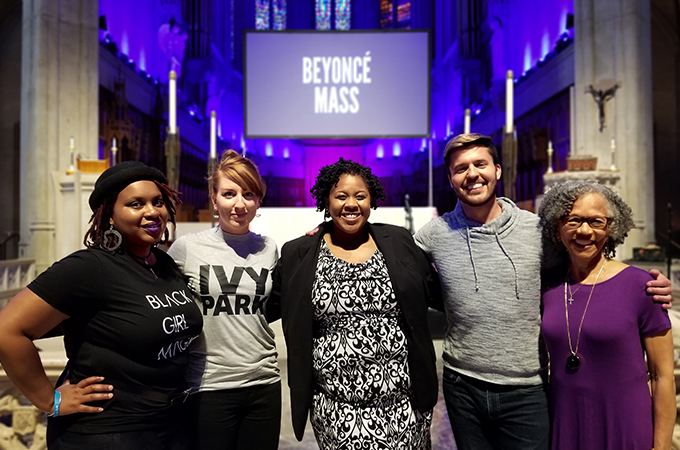 YMN: At the last Beyoncé Mass, I learned the importance of having a conversation that goes alongside it. The students and I worked together for an entire semester, and we were immersed in the information that framed the mass. Because I was so focused on the students, at first I didn’t realize other people were only getting the tip of the iceberg. The panel discussion is a way for us not only to have a conversation about black women and their participation in the civil rights movement, but also to set the stage for a conversation about what's going to happen at the Beyoncé Mass, including the role of music by artists such as James Brown, Aretha Franklin, Queen Latifah, MC Lyte, and so on. There will be a question-and-answer portion so people can ask questions and figure these things out in community. I'm excited because three black female scholars from different parts of the country will take different angles, help unpack historical perspectives, and discuss how the mass fits into those paradigms. BB: Why do you think the Beyoncé Mass is a good fit for the University of Redlands? YMN: That’s probably a better question for [U of R Provost] Kathy [Ogren], but there seems to be a belief at Redlands that it’s important to have a critical conversation about a broad range of social issues, and that's what we are doing. That makes it a good fit. I’ve turned down universities and colleges that have asked me to do a Beyoncé Mass at their school because I don't want black women's voices to be tokenized. So, unless there's a strong sense that the whole of the institution can participate in ways that engender critical conversations about race, ethnicity, gender, and sexuality, I won’t do it. BB: Do you have any final thoughts? YMN: For students on campus, even for students who might be skeptical, show up. If you don't show up, there's no way to participate in the critical conversation. So come, be uncomfortable, like it, don't like it, be changed, don't be changed—but come. To RSVP for the Beyoncé Mass, to be held at the University of Redlands Memorial Chapel on Monday, January 21 at 7 p.m., visit the event on the U of R Facebook page. To RSVP for the panel, which will be held on Sunday, January 20 at 7 p.m. in the Frederick Loewe Performance Hall on the Redlands campus, visit that event on the U of R Facebook page. For additional information, see the Bulldog Blog's "U of R to host groundbreaking 'Beyoncé Mass'" and the Beyoncé Mass website.